It's the common assumption, but is there any correlation between cold weather and winning in the Brady-Belichick era? PORTLAND, Maine — Cold weather and New England are as synonymous as anything. If we have three constants in the far northeast region, they are delectably delicious seafood, joyfully curious vacationers and ferociously harsh winters. Arguably, a fourth characteristic has been in play since the turn of the millennium: winning. 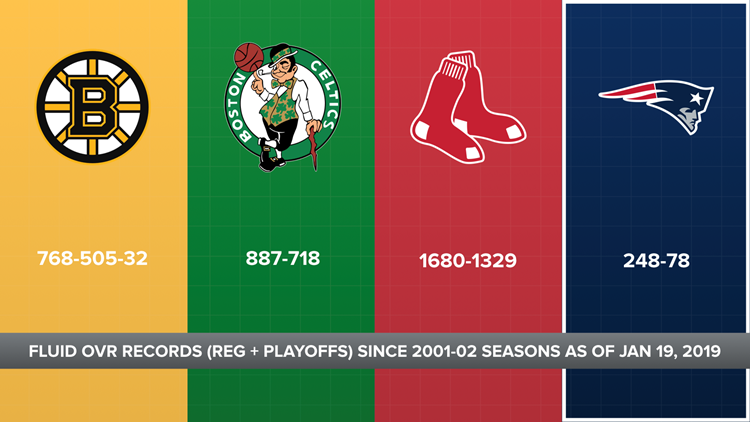 Since 2001, the four major sports teams that call New England home are a fluid combined 3583-2630-32, counting both the regular season and playoffs. That's an approximate winning percentage of 58 percent, a wildly impressive figure and likely the best among U.S. cities for that time period. But can any of that success be attributed to the cold weather? Considering that the Bruins (768-505-32) and Celtics (887-718) play their games inside, sans the occasional Winter Classic, and the Red Sox (1680-1329) are the boys of summer at Fenway Park, the Patriots are the only ones whose performance is directly and often impacted by environmental conditions. Fans regularly link the region's unique climate to the team's good fortune. New Englanders are proud to brag about withstanding the annual bitter chilliness, and in turn they fasten these traits upon the players for which they root. But here's the thing: The Patriots have played in Massachusetts since 1960, before 2001 they finished third or worse 25 times, and through it all the weather has stayed the same. Is it really the cold that's helping? Doesn't sound like it. Studying the collective temperature trends for all 900-plus games in Patriots history would've been ideal, but for the sake of saving me from more spreadsheets, I instead opted to isolate just the Brady-Belichick era. After all, that's when the team turned into the conquering juggernaut it now is, and if there's any weather-related interdependence, we should find it there. Since 2001, the Patriots are an astonishing 248-78-0 when including their postseason record of 28-10. That alone leaves little room to distinguish a weather effect — the franchise is just consistently great, regardless of factors. Of those 78 losses, nine happened underneath a dome or roof — three Super Bowls and away games in Detroit (1), Houston (1), Indianapolis (3) and New Orleans (1). Overall, New England is 22-9 playing indoors since 2001. There's clearly a cluster of defeats between 60 and 75 degrees, with four alone coming at exactly 64 degrees and three at both 61 and 72 degrees. Based purely off numbers, it's possible this data indicates a higher loss-percentage at higher temperatures; however, the logical conclusion would be to consider that these concentrated losses fall within a general average temperature at which most games are being played. The NFL season runs through autumn and winter, yes, but these losses include both home and away games — 26 and 42, respectively. Southern and some western locales tend to be moderately warm all year. The apparent shift may also have to do with the sheer number of wins versus losses. Since 2001, New England has 157 more wins than losses in games played outside. More data points typically present a wider range of values. Still, it's worth noting the major cluster of wins appears between the temperatures of about 40 and 65 degrees. When compared to losses, that's a shift of about 10 to 20 degrees colder. This remains in the general average of temperatures during which the NFL season takes place, but a shift between the concentration of wins and losses proves there is a tendency for better outcomes in the cold. Since 2001, New England is 141-26 at home. Another strikingly remarkable figure and very likely the league's best in that time period. Twenty of those wins, or about 14 percent, are playoff games; six are AFC title games. The Patriots are 84-43 on the road outdoors. Not nearly as good. Something that should come as no surprise is that the Patriots' home games are colder than their away games. Since 2001, game days at Foxboro average out to a temperature of 48.6 degrees. Alternatively, away games are 59.4 degrees. What does this mean? Well, removing playoff games on both sides gets you closer to an evenly split home-away share of wins and losses, however, since away venues vary each season and home and away games are placed randomly, thus differing the dates on which they're played year-to-year, it's impossible to get a truly unbiased comparison. Regardless, homefield dominance certainly coincides with colder temperatures. That's something. Their coldest game in this stretch since 2001 was a 2003 AFC divisional round matchup at home against the Titans, a 17-14 victory, in which the temperature was 4 degrees at the 8:15 p.m. kickoff. The next two coldest are 11 degrees for the 2004 AFC championship game at Pittsburgh, a 41-27 win, and 13 degrees for a 26-6 win versus the Jets at home in Week 17 of the 2017 season. Their hottest game was in Florida (shocking) at 97 degrees, a Sept. 16 game played in Jacksonville during Week 2 of 2018. New England lost 31-20. New England is 34-6 in games at or below 32 degrees. At the end of the day, none of this matters according to Bill Belichick, at least superficially. A severely cold game is just a game. "We'll be there." Full disclosure: I'm far from a mathematician, so go easy in the comment section. This could be broken down even further than it has been, but since I'm limited with the time I have we're forced to settle with, at best, a mediocre analysis.